A solution that provides mobile gaming companies a high-level approach to collect, store, and analyze massive amounts of player telemetry data. The biggest challenge for mobile game developers is building a robust and powerful back-end architecture to provide mobile MMOG players with a seamless experience comparable to traditional PC-based games. 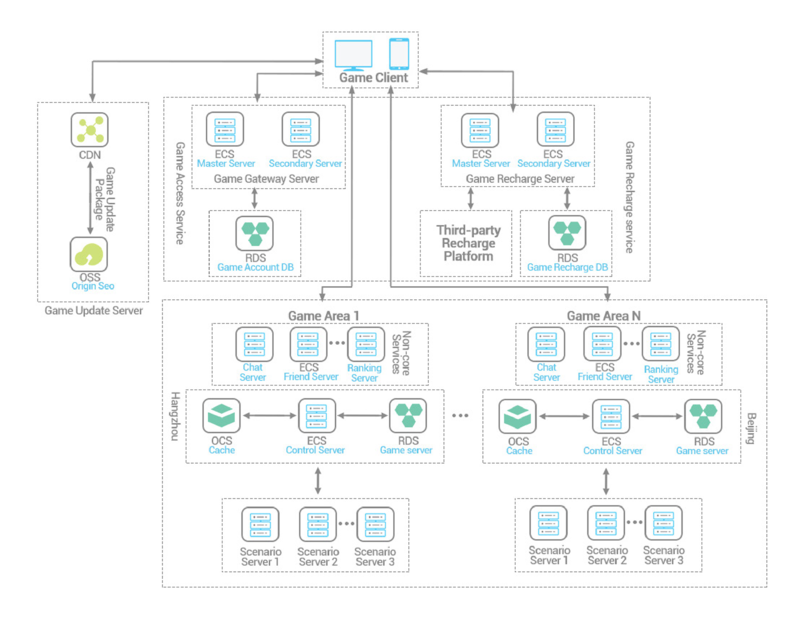 The following solution demonstrates how mobile game developers can build a highly scalable and optimized cloud architecture. 1.To serve a high number of players simultaneously in individual zones, mobile games use ApsaraDB for Redis. ApsaraDB is also used for Memcache to construct a cache layer that accelerates the reading/writing of player's game data. 2. Data in the cache is taken in regular batches for persistence storage to decrease backend database read/write pressure. 3. Static files can use the CDN service to accelerate file downloading. 4. Alibaba Cloud Auto Scaling service enables developers to conveniently build an automatic server activation system and provides users nearby access, increasing the network access quality. Also, security product Anti-DDoS can provide Wireless Application Firewall (WAF) as well as preventing DDoS attacks. A scalable and cost-effective content delivery service for accelerated distribution of any type of content to users across the globe. Shield against DDoS attacks and protect your network and data with a powerful and cutting edge security guard. A user guide to creating your virtual private network.